If you’re looking for a behind the scenes look at Richmond Park, then Park Life: The Memoirs of a Royal Parks Gamekeeper by John Bartram is a must-read. As a Royal Parks gamekeeper for 40 years, John has overseen the welfare of the deer and other wildlife in Richmond Park’s 2,500 acre spread. With a poignant introduction by Sir David Attenborough this excellent book gives readers rare and privileged insight into the life of a gamekeeper, including the yearly rituals such as the rutting season and deer culls. In places the book goes into considerable detail about the fascinating and occasionally unpleasant work that John has to undertake. This is especially true about the annual culls. Here, John gives us a sympathetic account of the process of calculating the numbers to cull (of both male and female deer) and the hard work involved in making sure those numbers are met. However, what you learn from these chapters is just how important the welfare of the animals is to John and his colleagues, even when dealing with the aftermath of such grim but necessary work. 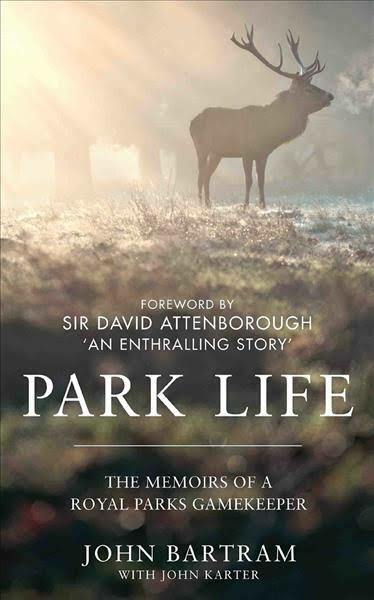 Even before reading this book I had nothing but admiration for the Royal Parks’ staff, but now I truly appreciate how important their work is and thanks to them we have wonderful places like Richmond Park to freely visit. The book is wittily written and is full of anecdotes about the day-to-day running of Richmond Park as well as the occasional highs (and lows) of dealing with the general public, film crews and assorted wildlife. On more than one occasion I found myself agreeing with John’s personal opinions, especially about irresponsible dog owners (don’t get me started). There are also a number of beautiful photographs, including those by one of the best Richmond Park photographers out there, Alex Saberi. Overall I highly recommend this book for anyone interested in wildlife, the environment and animal welfare, as well as anyone who’s ever visited Richmond Park and wondered what goes on behind the scenes. Please note: Moderation is enabled and may delay your Comment being posted. There is no need to resubmit your Comment. All photographs are © Simon Wilkes, except where stated otherwise. If you wish to use or license any of my images, please contact me by emailing your request to hello [at] simonwilkes.co.uk. All photographs © Simon Wilkes 2019.